Access routes to the monumental complex of the Alhambra and the Generalife by car. Monumental complex of the Alhambra and Generalife have restrictions to private traffic, although there some access to it that doesn´t get in to the city and allows to park beside the main entrance building to the complex. 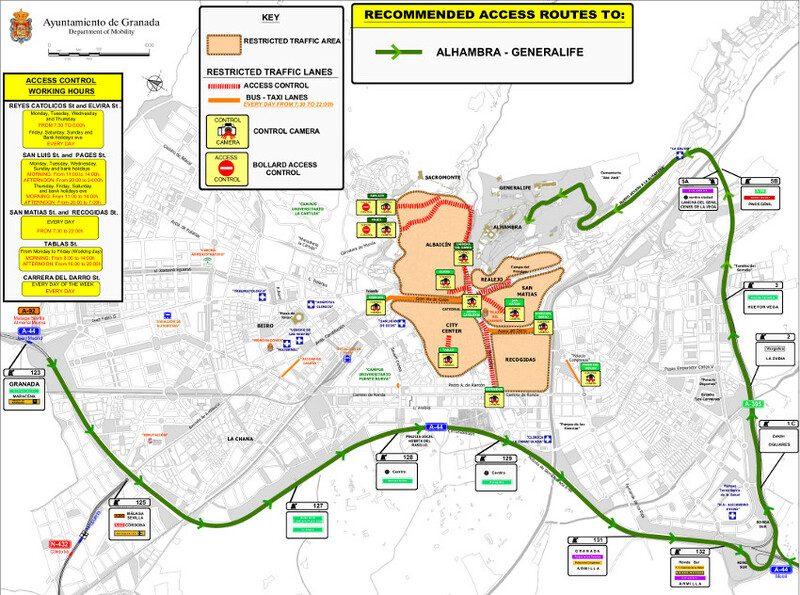 In the following map you have the recommended itinerary to get to the Alhambra for visitors using their private vehicle arriving from A-44 (Motorway Bailén - Motril). Access is through Ronda Sur (A-395) through Santa Maria de la Alhambra Avenue. Access to Parking del Generalife from Highway. In traffic and mobility terms, the Alhambra and its enviroment are specially protected because it is World Heritage. The access by car always will be taking the Motorway (A-44) - Ronda Sur (A-395) - Santa María de la Alhambra Avenue – Alhambra Public Parking. You can not get to the Alhambra by car if you are in the city center. Cuesta de Gomérez is closed to traffic before the entrance to the Alhambra Forest, you can only get on foot. The best thing to do, if you are using prívate vehicle , is to park in the Alhambra Public Parking and get to the complex on foot. If you are in the city and does not want to use your private vehicle, you can get through Cuesta de Gomerez from Plaza Nueva on foot or using public transport. Minibuses line C30 connects the city center (Isabel la Católica square) with the Alhambra, and line C32 connects Albaicín with Alhambra. Both lines are circular, you can get on/off along all their routes.